As we saw in Chapter 11, political life in the united Province of Canada in the 1850s was marked by frustration and stalemate. No single party commanded enough seats to enjoy a majority in the assembly. There were divisions along ideological lines, principally between liberal urban professionals and the wealthy merchant class in the Reform, Grit, Radical (and sometimes Rouge) parties and those Conservative-Tory-Bleu members whose support was located among the colonial elites. There were those who advocated extending democratic rights to the greatest number (of adult males) and others who argued that such innovations would only lead to mob rule. There were others — specifically the Grits — who eschewed compromise, a position that arose from their very principled outlook on political and economic life but which also made them extremely difficult to work with. The British Parliament had enjoyed centuries in which to develop a common language of political discourse; in the Canadas this had not yet happened and the factions presented in the asssembly only served to intensify some of the dividing lines. Another important fracture, one that was embedded in the mission of the Act of Union, was sectarianism. Durham and many of his predecessors regarded the Catholic Church in the St. Lawrence Valley as an impediment to progress, democracy, and good government. Every such pronouncement, of course, had the effect of reinforcing the belief among Catholics that the Protestant denominations wished to to destroy one of the key institutions of Canadien life. The fact that the powerful Orange Lodge said so regularly made it impossible for even the most inclusive Canadian leaders to shrug off the Canadiens’ concerns. The achievement of Confederation in 1867 can be seen as the culmination of effort on the part of colonial leaders and elites to find a way forward past substantial obstacles. It might also be understood as simply following British marching orders, the logical outcome of free trade, and the withdrawal of a British military presence. What can be said for certain is that the three founding colonies, along with Prince Edward Island whose representatives did much to give the conversation its shape, were able to do something extraordinary in the context of their colonial status: they designed their own constitution. Until 1867 every constitution in British North America since 1774 had been imposed by Britain. Here, then, was an instance where the colonials took charge. They were given permission to do so, but the result still constitutes a landmark. In 1862, when faced with yet another possible stalemate in the Canadian assembly, George-Étienne Cartier turned to his nemesis, George Brown, with an appeal for support. The Cartier government (in which John A. Macdonald was attorney general) was made up of the Parti Bleu and the Conservatives but was incapable of mustering a majority without drawing in another party caucus. Brown’s Clear Grits, however, had been virulently critical of the administration and there was little love lost between them. Four years earlier Brown’s own administration had fallen on a technicality. When sitting members of the assembly were appointed to the executive as cabinet members, they were obliged to resign their seats and stand in a by-election. Brown’s new government did so and Macdonald pounced on the diminished Grit caucus in the House with a successful vote of non-confidence. Brown was out; Macdonald was in. The Conservative Party then exploited a loophole that allowed formerly appointed cabinet ministers to be appointed to new ministries without a by-election. Macdonald shuffled his cabinet in one direction for 48 hours, then shuffled them back to their old offices: this was called, for obvious reasons, the double shuffle. In this way he avoided having to call the by-elections that would have put his administration in peril, but at the same time he earned the lasting enmity of Brown. The challenge facing Canada’s co-premiers Macdonald and Cartier in 1862 was the need for a double majority, that is, a majority of votes among the representatives of Canada West and Canada East respectively. Patching together a coalition that could perform this trick was one thing; finding a lasting solution was another. Brown’s unlikely cooperation was the key and the Torontonian was prepared to put aside his hostility toward Macdonald on the condition that they pursue a constitutional reform that would undo the handcuffs into which Durham and the Act of Union had locked the Canadian government. Brown’s cooperation came with further conditions. His personal and political vision of a renewed British North America was bigger than Macdonald and Cartier’s: Brown saw it extending from the western limits of Rupert’s Land through Newfoundland. His newspaper, the Globe, for years sharply criticized the HBC and called for Britain to surrender Rupert’s Land to Canada. In addition to an imperialist agenda, Brown brought to the table the germ of federalism. Brown had chaired a constitutional committee of the legislature that had advocated, in a 17-3 vote, a federal arrangement between Canada East and Canada West. (One of the three opposed was Macdonald.) Brown was also intransigent about representation-by-population. The population of Canada West in 1861 passed the 1.3 million mark and Canada East was trailing by 200,000. Based on these numbers, Brown believed, Canada West should have a significantly greater number of seats in the House. To Canadien politicians like Cartier, this was a warning flag: any central administration in which Canada West easily dominated would be resolutely opposed to the cultural interests of francophone Catholics. Macdonald’s preference for a unitary state: a single province with a single government and one capital could potentially be worse. Representation by population combined with legislative union would give Canada West (soon to be Ontario) utter dominance over Canada East (i.e., Quebec). 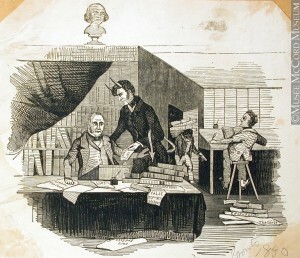 Figure 14.4 George Brown inspired strong feelings among his followers and his enemies. This 1850 cartoon by John Henry Walker suggests that the highly principled Brown cannot resist temptation, especially when it comes to spreading falsehoods in the Globe. The only way everyone was going to get most of what they wanted was through a carefully crafted federal structure. If Ottawa could retain responsibility for areas of common interest while the provinces took charge of matters specific to their respective communities, both sides might be able to live with the deal. The challenge, then, was determining how to parcel out these jurisdictions, which was no small matter. Canada East, or at least the French and Catholic part of Canada East, wanted exclusive authority over education, health care, and social welfare. These were areas over which the Catholic Church had a near monopoly in the lower province and considered necessary to preserving the culture. Fear of assimilation into an anglophone majority was front and centre in Cartier’s calculations. Only by containing schools, hospitals, and welfare within the prerogative of Canada East could politicians like Cartier begin to countenance Brown’s demand for representation by population at the central level. Realizing that the possibility of safeguarding French-Catholic culture was achievable allowed Cartier to consider what had previously been unthinkable: adding more Anglo-Protestants. If francophone Canada’s key institutions could be preserved in a federal arrangement, it wouldn’t matter how many English-speaking colonies joined the new country. Adding on the Maritimes might, in fact, strengthen the Canadien side, as there were large numbers of Catholics in Prince Edward Island and New Brunswick, and there were Acadians spread throughout the three colonies as well. Brown, of course, saw the Maritimes as a zone of anglophone Protestantism that would reinforce the cultural agenda and values of Canada West. For Macdonald, by contrast, the principal consideration was the economic prospects of a larger union — such as ice-free ports in the Maritimes. For their part, the Maritimes approached the whole conversation with skepticism and coolness. There is room to debate their motivation, i.e., did they jump or were they pushed? It is a fact that the Colonial Office in London made it plain that the time had come to consider Maritime union: an amalgamation of Prince Edward Island, New Brunswick, and Nova Scotia. A century of separate histories and no small amount of competition, however, made the respective colonial administrations wary of one another. They were different places in many respects, as shown in the 1861 census. New Brunswick’s population was 16% British-born and 79% New Brunswickers; Nova Scotia’s population was 89% homegrown. Catholics made up 44% of Prince Edward Island’s population, about a third of New Brunswick’s, and only 27% of Nova Scotia’s. Prince Edward Island had little in the way of manufacturing, but nearly a third of Nova Scotians were considered part of the “industrial class,” nearly 50% percent more than in New Brunswick. The export markets were different as well, as statistics from 1865 demonstrate. New Brunswick and Prince Edward Island sent 40% and 68% of their shipping, respectively, to one another and to Nova Scotia, but Nova Scotia was sending barely a third to its Maritime neighbours. More than 50% of Nova Scotian shipping was headed to the United States, the destination of only 37% of New Brunswick’s exports, and a mere 17% of Prince Edward Island’s. Alone of the three colonies, New Brunswick continued to ship a significant share of its capacity — 15% — to Britain. The value of shipping out of New Brunswick had grown by a very respectable 83% over 1850-65, but it underperformed Canada (at 162%). Prince Edward Island’s exports, however, nearly quadrupled and Nova Scotia’s grew by 452% over the same 15 years. In dollar terms this meant that in 1865 Canada shipped out $42.5 million in goods while the Maritimes together exported about $16 million, a very favourable comparison from the Atlantic perspective. The makeup of the Maritime legislatures was also different: farmers, lumbermen, and shipbuilders dominated in Charlottetown; lawyers and merchants, bankers, and manufacturers held more than 60% of the seats in Fredericton; and shipbuilders combined with lumbermen and lawyers constituted a majority in Halifax. Overall, the Maritimes were doing better than Canada in terms of economic growth: they had more diversified markets, and they’d achieved a degree of complementarity as revealed in the amount of traffic between the three colonies and their respective market specializations. Culturally they were different, however, and politically they had distinctive issues as well. Whether Maritime union would ever have been possible is a question we now can never answer. 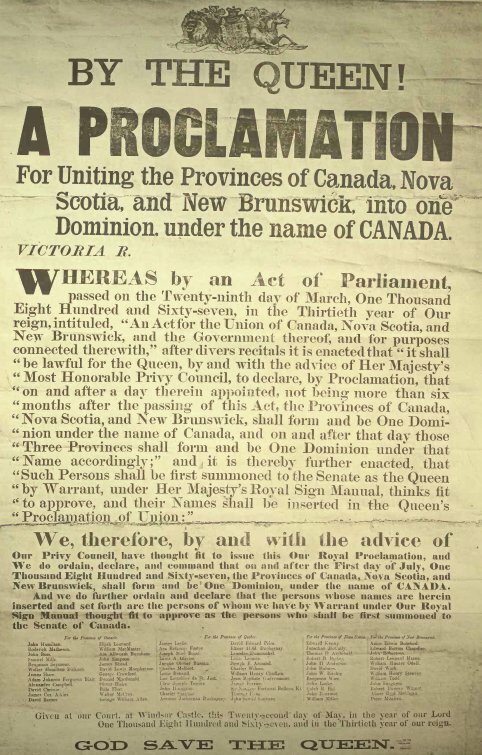 As the three colonies prepared to meet in the summer of 1864, they were approached by the Canadians with a request that they be included in the conversation and that the possibility of a larger union be considered. Confederation represents in part the outcome of frustrations in the Province of Canada arising from the difficulty of building lasting and stable governments. George Brown’s cooperation was both necessary and formative: his conditions included a federal union to replace the unitary union and the annexation of Rupert’s Land. Federalism had the potential of preserving Canadien culture against assimilationist tendencies. Maritime interests in Confederation were distinct and strongly reflected external pressures. 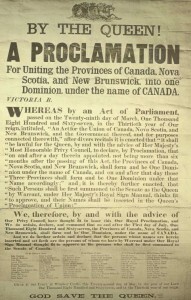 Proclamation Canadian Confederation by Voyager is in the public domain. Engraving by Walker, John Henry is used under a CC-BY-NC-ND license. This image is available from McCord Museum, under number M930.50.7.492. 14.2 Considering Confederation by John Douglas Belshaw is licensed under a Creative Commons Attribution 4.0 International License, except where otherwise noted.